Highlight: Pinterest is the breakout star in Social Networks- 10 times increase year to year. In 2012, people spend 121 billion minutes on social networks, which is 37% more time than last year's 88 billion, Nielsen's latest Social Media Report said on Dec 3. The mobile devices and connectivity helped fuel the continued growth of social media, people’ time spent with social media on mobile apps and the mobile web has increased 63 percent in 2012, compared to the same period last year, Nielsen report says. Pinterest- Pinterest emerged as a one of the breakout stars in social media for 2012, boasting the largest year-over-year increase (1047%) in both unique audience and time spent of any social network across PC, mobile web and apps. Facebook- Facebook remains the most-visited social network in the U.S. and is multiple times the size of the next largest social site (Blogger.com) across each platform. The site is also the top U.S. web brand in terms of time spent, as some 17 percent of time spent online via personal computer is on Facebook. 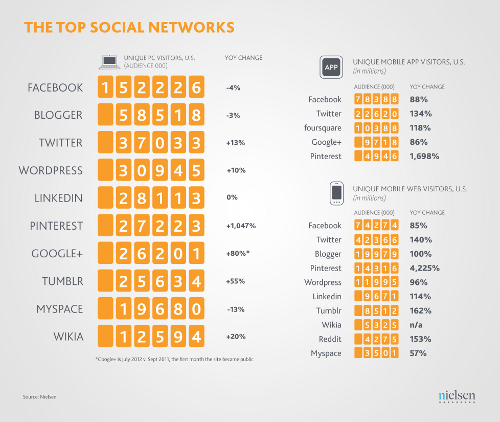 Nielsen's complete report: State of the Media: The Social Media Report 2012. What do you think? Which social network do you use the most and spend more time on? Share your experience and insights in the comments box below.